I like Megadeth therefore I like Vindicator. That’s a pretty simplistic statement, but it’s also a very reliable one. 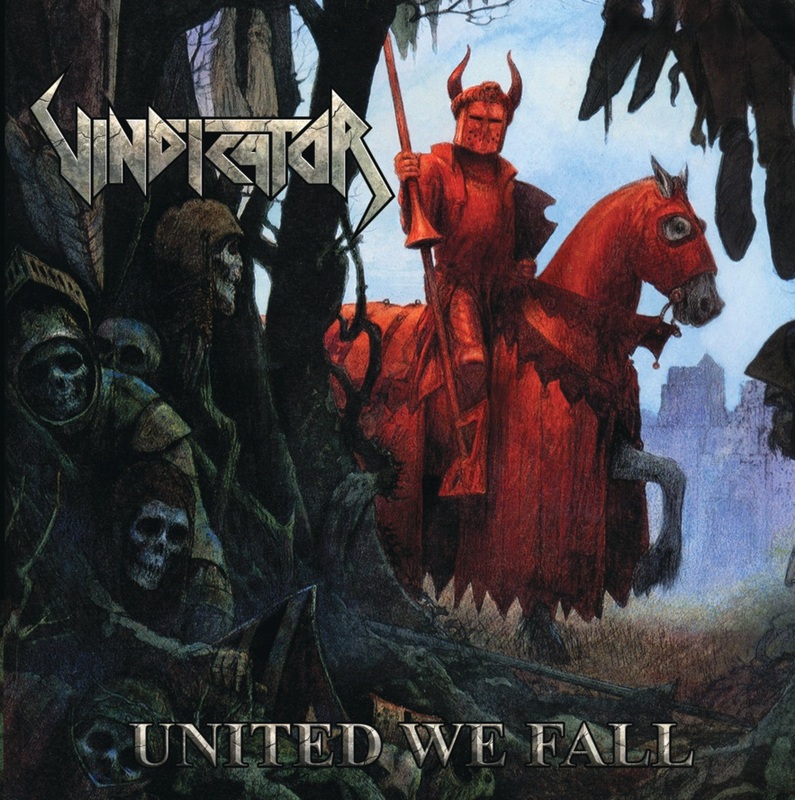 If any of you guys are Megadeth fans, then you will most likely enjoy listening to Vindicator. I got introduced to Vindicator when Heavy Artillery (great old-school label, dicoverer of Enforcer, Vektor and many other super talented bands, now part of Earache) sent me a promo for Antique Witcheries, the band’s second album out in 2010. After that awesome record, the band just went under the radar (at least under my radar), and I found out almost by accident that they released their third full-length; United We Fall on Slaney Records earlier this year. And trust me; for less than 10 $/€ (shipping included) you guys can acquire one hell of a thrash record. Original singer Marshall Law has quit the band, and the vocals are now handled by mastermind guitarist and composer Vic Stown. The guy hasn’t got THE voice, but he sure knows how to sing. Kind of like Mustaine -from you know what band- uses his vocals smartly. Vindicator also got reinforced by former White Wizzard guitarist James J.LaRue. By the way, White Wizzard already have one of the most impressive “former members list”: 12 past-members listed by Metal Archives, for a band that’s been active since 2007, I say BRAVO! But let's get back to United We Fall as this record is made out exactly of the type of Thrash Metal I love: it’s rapid, sharp, violent, and aggressive, it’s got some killer riffs, awesome choruses and some outstanding solos. What else could you possibly need??? I’m a huge fan of that old-school Thrash, still close to it’s Heavy Metal and Punk-Rock roots. I mean, I can’t stand the “clinical” Thrash Metal bands, that just accumulate heavy riffs without that hysterical and "close to the edge" feeling. When I listen to Thrash, I want the music to screw with my mind, make me nervous, it has to make me want to go down the street and start a fight. It also has to make me hate the way our society goes, and just protest over anything! If Thrash bands don’t do that, then who the hell would do it anyway??!! And that is why this band reminds me of Megadeth, although musically there are some similarities as well. Just listen to “Nationwide Ruination”, or “Fatal Infection”, you’ll feel that you’re back in the late 80s, somewhere between Rust In Peace and Peace Sells. The similarities are sometimes so obvious that you can recognize some Hangar 18 solo parts here and there. One of my favorite thrashers this year, a MANDATORY purchase of you like Thrash Metal!